I freaking love this series! Seriously! It’s now definitely on my favorites list. It has everything, from a fast pace, to an interesting storyline, to an amazing love interest and all of it written in an extremely fascinating and capturing way. I could not put this second book down. But first things first. 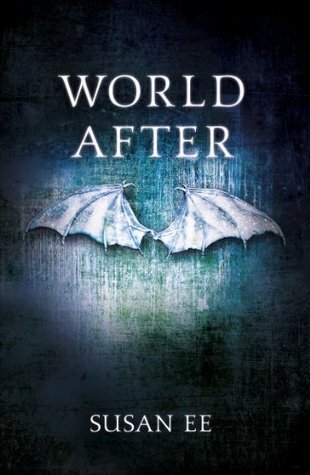 World After starts exactly at that moment where Angelfall ended. Exactly at that moment. Like 2 minutes after Angelfall’s ending. That threw me a bit off in the beginning, as I had finished Angelfall a few months ago and didn’t 100% remember exactly at what point of the story we were left. I got over it a few pages later, though, and after that had no problem orienting myself and getting back into the story. The positive side of that was that we were thrown back into the middle of action again. If you thought the first book was fast paced and action packed, you have seen nothing yet. The second has much more fighting scenes, terrifying creatures and anguishing moments. It also has a lot of gore. Like, really a lot of it. Those creatures that I mentioned? They are described in every detail, as is every fight scene and knife-cutting-through-flesh moment. If you are not really into that, then I wouldn’t recommend reading this book. I, however, had no problem with it. Okay, maybe it wasn’t my favorite part of the book, reading how exactly a person looked with parts of his/her body missing, but it definitely added to the story. I can’t imagine reading this exact story without all those gory details, it would be too different. I really liked where the story went and by the end of the book I could start seeing some mysteries getting unfolded, though not yet completely. I also liked seeing more of Penryn’s sister, Paige, as she was completely absent in the first book. We can now get to know her a little better, or rather get to know the new Paige after the whole cutting and stitching and monster-izing procedure happened to her. She’s quite different now, but still the dynamics between her, Penryn and their mother are very strong. Speaking of which, I loved that we had a few moments with the girls’ mom. I always thought she added a creepy, yet fantastic edge to the whole story. Definitely looking forward to reading more scenes that involve her! The one thing I was a bit disappointed about, was that there was not a lot of Raffe! The witty little dialogs between him and Penryn had been my favorite part of the first book and we didn’t get enough of them in the second. I’m also very excited to finally start seeing some romantic action between those two! I ship them so much! I do like that the relationship is going slowly, because it actually makes sense if you think about the whole “forbidden” thing and all, but I can’t help but want to see those two together as soon as possible! That being said I have to admit that I didn’t REALLY mind him not being there, just because there were a million other things happening to keep me busy. So that’s a huge thumbs up for the writer for making me love the story even without Raffe in it (who is actually my favorite part of the book). But, we do get at least some smartass dialog towards the end of the book that honestly made me laugh out loud. I was seriously sitting on my sofa, reading the book and laughing all by myself. Thank you so much dear Susan Ee for making this book so funny and pleasurable and un-put-downable and awesome-tastic! I cannot wait for the third book to come out! I seriously cannot wait! Love where the story is going and how some mysteries are getting unfolded. Would have loved to have some more Raffe scenes! It got my attention from the very first page and I couldn’t put it down until the very last one! The plot, the characters, the dialogs, everything was absolutely flawless. The book started off in the middle of action and continued being full of action throughout the whole story. There was really nothing I felt was missing from this book. I was also always having a clear picture in my head of everything that I was reading. So it felt kinda like reading a movie script and I hope it gets turned into a movie someday. The only thing that annoyed me a bit is that it became a little too gross at some point towards the end, but that was really just a minor problem. I loved almost every character of this book. My top two favorites would have to be Penryn, the main character, and her mother. Penryn is very strong female character, always ready to take action and practically taking care of her mother and little sister. Her mother is really a very interesting character. She is suffering from some sort of mental disease and she thinks that demons are talking to her and making her do things. Of course with this kind of book one can never be sure if she really is crazy, or if everything she is imagining is really true. She is mainly the thing that makes this book so creepy and dark at times. One of the best books I’ve read this year! I’m looking forward to the sequel coming out this fall and any other book by Susan Ee. Really, just one of a kind! And I’m not even a fan of angel books.